Noting the SLFP Youth front too, had made a similar request, the MP said that the Thera could be pardoned as soon as Feb. 04. However, the president had criticised SLFP National Organiser - Duminda Dissanayake for publicly making a request to pardon the Thera, after visiting the Thera at the prison. Gnanasara Thero was jailed on 8 August 2018 for six years, after being found guilty of Contempt of Court over his conduct during a Court hearing regarding the case of missing journalist Prageeth Ekneligoda. Gnanasara Thero was found guilty of four charges filed by the Attorney General’s Department for his behaviour. He was convicted on four counts of Contempt of Court, receiving terms of four years each on the first and the second counts, six years on the third and five for the fourth, all to run concurrently. 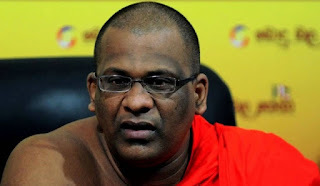 In 2016, Gnanasara Thero had interrupted a Court hearing over the abduction of the journalist Prageeth Ekneligoda, in which military intelligence officials were accused. The monk, disagreeing with the proceedings of the Court, shouted at the presiding Judge and lawyers as the accused military men were refused bail. The same day, he also threatened the wife of the missing journalist, Sandhya Ekneligoda.